Check out the resources by Proud to be Primary with this handy clickable resource guide! Find what you need easily with the click of a button! Are you looking for primary literacy, math or science? Click on the category you need and you will be directed to a webpage with linked pictures of everything available relating to your choice. ♥Click HERE to follow our store and receive notifications of new product releases, sales, and freebies. ♥Join our email list and get weekly teacher tip emails and access to our FREE resource library. 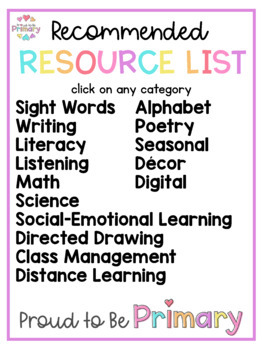 ♥Visit our website at Proud to be Primary for tons of engaging ideas for teaching kids in the classroom! ♥Join our Facebook group and connect with thousands PROUD primary teachers like yourself.